Finally, I've got a "girl"
Oh brother! Happy Halloween everyone. Here are my "boys" this evening. Chowhound is the "football player". Notice his puffy muscles. See the gray neck. 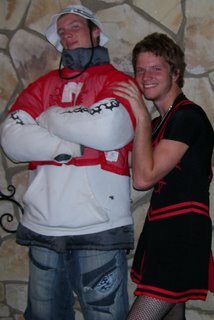 Yes, that is the p*nis jacket underneath the sweat shirt. He is only about 12 inches around underneath it. Just as I dreaded, his first thought was to go as a big, grey p*nis. AHHHHH! Luckily, he liked my suggestion of the sweat shirt. Slick thinking on my part. The cute cheerleader is Daredevil. Bet, you figured that one out before I even told you. Daredevil went to his girlfriend's soccer practice dressed like that. Fishnet stockings and all. She was quite proud....and embarrassed. As everyone told me when he was little, "He's too cute to be a boy." This has been a perfect birthday weekend. All flights were on time for a change. So, I'm back here in Exuma, Bahamas with my Sweetie. We got two dives in yesterday. The water is still warm and was relatively clear. The first dive was a beautiful reef with lots of fish. We came upon a 5ft Nurse shark sleeping. We didn't see any point in waking her. Besides, she had a nice size lobster guarding her. That was just the first of four lobsters we spotted on that dive. There were a couple of nice size groupers but none as large as the one that followed us around during the second dive. There is a old tug about 70ft down. George the grouper captains it. The local dive shop frequents it and the divemaster brings squid for George. Needless to say, George is friendly and fat (about 20-25 lbs). I personally can vouch that Grouper can have puppydog eyes. George was pitiful. He kept begging for food. He wouldn't leave me alone. I'd turn around to see where he was and almost bump noses with him. George will let you pet him. Spoiled fish. Unfortunately, we didn't take the camera with us but we are planning on taking it today. Hopefully, I can post pics when I get back state side. We only have dial up here on the island. Time to pack up the gear. I'm wasting precious diving time. I am being absolutely worthless today. I arrived at my Sweeties on time last night. First, time in two years American Airlines didn't treat me to an all expense paid night in Miami. So, today I am 'laxing in the hammock reading my book, soaking up the sun and being rocked by a gentle sea breeze and doing nothing else. Ah, paradise. No problems Mon! Another dinner conversation that left me shaking my head. I couldn't imagine what life would be like if I had daughters. I grew up in a house full of girls. There were four of us with only 7 years between oldest and youngest. I don't remember having conversations like this with my sisters even when parents were around. My boys keep it sooooooo entertaining. Tonight, we are sitting around the table discussing the weather. Yes, that is appropriate dinner conversation. That is a topic I can handle. Although, I do have to admit that most of the time I find out about the weather by walking outside. I'm not a news person. And weather doesn't affect my job any more so it is not on the must know list. However, I did catch wind of a conversation on the radio and at work today, that a cold front is coming through. I hate cold weather. I live in Florida. It should be warm all the time. Unfortunately, I live in North Florida and evidently the emphasis will be on North tomorrow. It is supposed to be a frickin 37 degrees in the morning. Holy Crap. So, this was what the boys and I were discussing. Me: It's going to be 37 in the morning. Daredevil: Sweet! I'm wearing shorts. Chowhounds eyes light up and he darts off to his room abandoning his chicken and dumplings. My thoughts are "Oh, No. What now?!" He drags himself back into the dining room with disappointment on this face. "Darn. It's at Dads." I'm squinting my eyebrows together trying to figure out what in the world he is looking for. All of a sudden Daredevil cracks up with "What? Your big grey p*nis jacket?" I am so glad I was not consuming anything at that moment. Summer before last Chowhound went on a cross country tour with a Drum and Bugle corp. He returned with this extra large downfilled grey jacket. It is extremely puffy and has one of the collars that zip up to cover your neck. But, since he is an extra small and the jacket is an extra large, it covers up all but about from his eye brows up. He ducks his head in and out of the jacket collar. Hence, the comment from Daredevil. Do a visual here. I think you got the picture. Actually, Daredevil admitted that one of the girls at school called Chowhound that. I think he got the coat out of the lost and found at one of the schools in Maine or some place up there in the frozen zone. He brought it home, washed it, and has declared it appropriate Florida Winter attire. It is probably good to around 30 degrees below zero or some ridiculous temperature that should just be a myth. One cold morning he came out in a tee shirt and shorts. I cut my eyes at him and suggested he may want to wear something a bit warmer. I waited in the car while he "changed". Yeah, I should have known better. He struts out of the house looking like Popeye after a dozen cases of spinach. He was wearing this puffy jacket underneath a sweatshirt. This was another rattle my brains moment. You know, one of those times when you just shake your head, laugh, and wonder where the hell did this child come from. And, I'm really hoping it warms up and slips his mind before Halloween. I can just see some kid coming to the door for candy and this big grey thing greets him. Anyways, back to the dinner conversation. At this point, I'm trying to change the subject and get that awful vision out of my head. One does not want to picture their child like that. It's just wrong in all kinds of ways. So, I switched gears and updated them on their cousin. My oldest sister (the one with the new marine), her husband, their oldest son (not the marine), and his girlfriend went to Orlando on Friday. Her son, Z, proposed to his girlfriend on Friday night while in the tree house at Disney. Then, on Saturday night, his new fiance rode with him in the ambulance to the hospital. What a wonderful way to celebrate your engagement. After spending half the night doing CT scans and the sorts, they determine he had an extremely large gall stone which required surgery. So, then I updated them on my Sweetie's mother. Her appendix ruptured almost 2 weeks ago and she is still in the hospital. Then, came the observations that we have body parts we don't need. It included speculation on why we have an appendix if we don't use it. Now, they are trying to come up with other body parts aren't necessary. Daredevil comes to the conclusion: "Well, some people have a brain and don't use it." I tried hard not to point fingers. Good Grief. Daredevil: "Where did I put my other shoe?" Chowhound: "It's on your foot." Nothing like trying to get dressed while your still half asleep. My sister got married yesterday! In Las Vegas! By "Elvis"! The maid of honor was a show girl who escorted the groom down the aisle. I got to "be" there and I didn't have to board a plane or even take off from work. Live web cams are the next best thing to being there. I have to admit at first I was a little disappointed in her wedding plans. It would have been wonderful to have everyone attend in person. But, it is her wedding day and she is entitled to do it anyway she wants. Besides, the type of ceremony or place does not diminish their feelings for each other. Trying to plan a traditional wedding and coordinate everyone and everything is extremely stressful. Her man had to go to Las Vegas for a conference so they decided to go early and get married before it started. I was thrilled to be able to watch it live. My co-workers gathered around my desk and attended too. It was exciting to know that this wasn't a replay. It was happening right then. My sister was gorgeous. Absolutely stunning. I listened to her giggle when she couldn't get the ring on his hand. I could see the love in their eyes as "Elvis" sang Love Me Tender. Congratulations E & L! E, I am thrilled to have you as a brother. And L, I have never seen you so happy. I know your love will only grow. I toast my glass to you both. 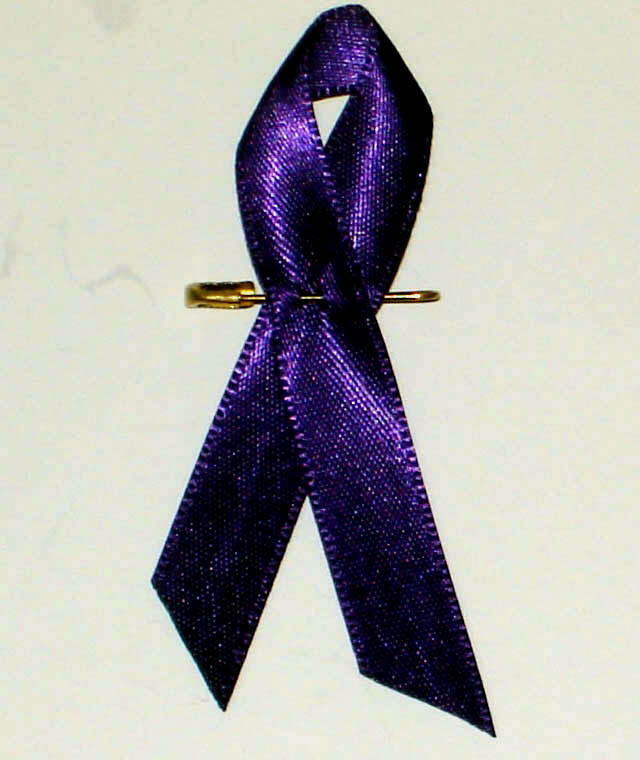 I went out in search of a purple ribbon today. I have been meaning to get one and wear it. Today, it hit close to home. Only a few miles away in fact. Today, unfortunately, a name can be added to the remember my name project. She followed the law. He didn't. A piece of paper didn't stop him. An ankle monitor didn't stop him. His conscience didn't stop him. The police didn't stop him. So, today there is a yellow ribbon with the words crime scene surrounding a home. Today, there are two children who will grow up without a mother. Today, there is a man still fighting for his life. Today, there is another senseless death. Today, I grieve for a family I don't know. Today, they have hundreds of unanswered questions. Today, they want to know WHY. I don't have an answer. I don't understand it either. I have gotten where I hate to watch the news or read the paper. Everyday, there is more and more senseless violence. More deaths that don't have to be. I wish I could climb up high enough for all the world to hear me shout, "STOP!" I wish I could scream that loud. A loud piercing scream that would get everyone's attention. But, there are no mountains high enough. No one voice loud enough. I'm just frustrated. I can see so much wrong in the world and I don't understand why people don't open their eyes. I came home from work today starving. I decided a tuna salad sandwich sounded really good as it has been a while since I have had one. I dutifully and out of sheer politeness (because that's what mothers are supposed to do) asked Chowhound if he would like some. Of course he said yes. (He doesn't have that nickname for no reason). I fixed TWO cans of tuna complete with eggs, pickle relish, the works. Told Chowhound it was ready and made the mistake of turning my back. When I went to fix my sandwich the bowl was empty. I find him sitting in front of an empty plate with hamster cheeks. "Oh, did you want some?" Ramen noodles are now cooking. Two packages. Maybe I will get some. Oh boy has the last week been full of blog fodder. It's been so full there hasn't been an opportunity to sit down and take it all in much less write about it. I'll just hit the highlights. Ground Zero. I was there. I leaned against the fence and fought back the tears. I thought about Michelle, her friends and the other people lost that day and I prayed. I quickly scanned the banner of the 2,996 names looking for the ones I learned about because of the project. My group was moving on and I had to catch up so I never found the names I searched for. But, in my mind I could see their faces and I renewed my vow never to forget. I never saw the towers in person. NYC was never on my list of must do. But, I am so glad that I had the opportunity to spend a few hours there. Moon sighting. Daredevils. Yes, demons or something possessed that child during a band trip and he mooned the car behind the bus. It was okay in that it was some of the other band students. But, the old lady in the car next to it was slightly offended. She wrote down the bus number and reported it to the school transportation office. The Principal just told the Band Director to "deal with it". So, after the Band Director gained his composure and stiffled his snickering, he sternly warned Daredevil not to pull that stunt again. The discussion of this incident was a whole other fodder bit on it's own. Daredevil and Chowhound has consumed massive amounts of suger for dinner prior to this dialoge. It sounded like a scene out of Porkys. "So your friend's ratted you out?" "Must have. They didn't do a line up." TMI big time. He is 19 now. I have no business knowing what his backside looks like. My days of wiping that have been long, long, long, gone. I flew into Newark, NJ yesterday. I am always in awe of the land below when flying. It is incredible to see the vastness of the forest, lakes, oceans and towns. I have flown into Miami, Jacksonville, and Los Angelos. These are the largest cities I have seen from the air. Nothing prepared me for the site of New York City from the air. I am just in awe. Of course, I have seen photos and shots of the city in Movies, but that can't replace seeing it in person. To quote Dax, "Just Damn." Xerox sponsers the Let's Say Thanks Program. Go to the website, pick a postcard drawn by a kid, add a message and they will print it and send it to our soldiers. It doesn't take but just a minute and will most probably make a homesick soldier feel a little closer to home knowing that we do care.